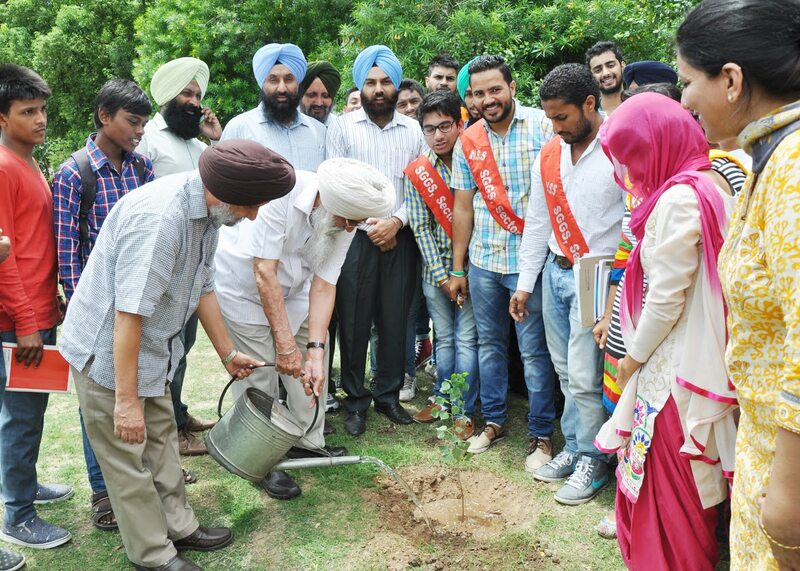 Chandigarh 30th July:- Sri Guru Gobind Singh College, Sector 26, Chandigarh celebrared the occasion of Van Mahotsav by organising a tree plantation drive in the College Campus. The function was organized by the NSS unit of the College. A number of green plants of different species were implanted. The function was inaugurated by Col.(Retd.) Jasmer Singh Bala, Secretary, Sikh Educational Society, Chandigarh. He, dwelling on the motto of NSS "Not me but you", aprised the students of the importance of and need for social service. Prof. S. S. Dhillon , Principal, extended all out support to the event and graced the occasion with his presence. Dr. Jaswinder Singh Khun Khun, Director, Punjab State Forest Development Corporation, was also present on the occasion. The function was made a success by the enthusiasm of NSS volunteers , under the expert guidance of NSS Programme Officers, Prof. Amandeep Kaur and Prof. Sandeep Singh Gill.